Bay Colony in the News | Bay Colony Development Corp.
Bay Colony Development Corp. was recently named the #1 Certified Development Corporation for 504 loan approvals in Massachusetts by the U.S. Small Business Administration. We are thankful to all of our lending partners in Massachusetts, Rhode Island, Vermont, Connecticut and New Hampshire for their teamwork in FY 18 which allowed us to assist 116 Small Businesses throughout our communities with 504 project financing of over $59 million dollars. We look forward to another successful FY 19! Pictured: Bob Nelson, MA SBA District Director, Erik Adams, SVP, Director of Marketing for Bay Colony Development Corp., Mary Katherine Mansfield, President and CEO, Eberto Ranero, Heather Storme and Bradley Nichols, Bay Colony Development Corp. Business Development Team. Bay Colony Development Corp would like to congratulate Feldman Surveyors as being named as a 2018 Preservation Achievement Award Recipient. As neighborhoods change over generations, it’s important that touch points to their past both remain in place and sensitively evolve to maintain their relevance. Old becomes newly pertinent, rejuvenated, present. Sometimes work focuses on high-level restoration techniques. Other times stronger modern interventions with a sensitive nod to the context of their surroundings are at play. Congratulations to our borrower, Jack’s Abby for being named by the SBA as Manufacturer of the Year. FRAMINGHAM – When Jack’s Abby Craft Lagers opened in 2011, its founders had no employees, relying on themselves, family and friends to produce and sell the beer they brewed. Now, Jack’s Abby is in a much larger facility, brews nearly two million gallons of beer a year and employs nearly 150 people. Due to that growth, the Small Business Administration on Thursday announced that Jack’s Abby has been named the 2018 Small Business Manufacturer of the Year for Massachusetts. Since opening, Jack’s Abby has grown from serving just the local community to distributing its beers to several states and brewing beer under two brand names — Jack’s Abby and Springdale. The success has a lot to do with the support the people of Framingham have shown the brewery. Jack’s Abby used a loan from Bay Colony Development Corp., an SBA-certified development company, to open its beer hall at 100 Clinton St. in 2016, moving from its original location on Morton Street. Currently, Jack’s Abby brews nearly 60,000 barrels of beer (a barrel of beer equals 31 gallons), but has the capacity to grow to 100,000 barrels, Jack Hendler said. The goal is to continue to grow as the craft brewing industry grows. The Hendlers will be honored at the annual SCORE Boston/SBA awards ceremony on May 4 at the Sheraton Needham Hotel. Check out a video below of the brewery. It’s finally here! After hearing about it for over a year, the SBA has announced that the 25 Year 504 option is available for loan applications approved after April 2, 2018. The 25 Year option is available for New loan applications approved after April 2, 2018, previously approved loans can not be changed to the 25 Year option. The Third Party Lender loan has to have a minimum term of 10 years. The first 25 year debenture is expected to be funded July 2018, pricing for the initial 25 year debenture will have a spread no wider than 35 basis points above the current 20 year rate. For example, based on the March rate of 4.99%, an indicative 25 Year rate would be 5.34%. (25 year rate pricing will be based upon supply and will be modified once demand for the option is established). Prepayment penalty for the 25 Year loans will be 10 years, the same as the 20 year option. Give us a call to discuss how this new option can benefit your borrowers! 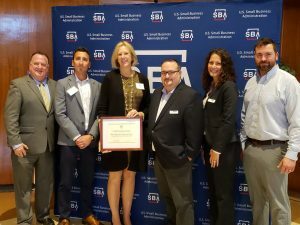 Bay Colony Development Corp was recently named the top SBA 504 lender in Massachusetts in both number of loans and dollars lent to small businesses in the state. We would like to thank our lending partners for your continued business and trust. In FY 2017 we were able to assist 121 companies with nearly $55 million in 504 project funding in the states we do business. Thank you for a great year and we look forward to a successful FY 2018 with your support. 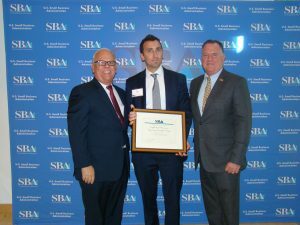 Pictured is Mark Hayward, SBA Acting Regional Administrator for New England, Erik Adams, Director of Marketing for Bay Colony Development Corp and Robert Nelson, District Director, SBA Massachusetts.